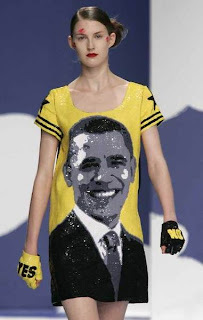 Sequin black and yellow dress with Obama's face print, now I'm not American but had to Post this as I am black, and hope The Black Americans get their Black Presidency!!! Don't know what the make up was all about, it looks super whack they should have just kept the make up clean I don't know...!!! !